As Delta Air Lines continues a seemingly open attack on its partner Alaska Air Group at its Seattle hub, Alaska Airlines is stressing that alliances like its long-time pact with Delta are complicated. Its overall message is that it will work with Delta where it is mutually beneficial and compete vigorously as Delta continues its encroachment. Delta’s latest moves are in two of Alaska’s key north-south markets on the US Pacific west coat – Portland and Seattle. Ironically, Delta seems to be practicing what Alaska executives recently stressed to analysts – removing emotion from evolving competitive dynamics. As Delta continues its moves into Alaska’s markets unabated, it certainly is showing no emotion as Seattle continues to rise in prominence in Delta’s domestic and international network. Just how the current competitive build-up by Delta in Alaska’s markets will affect their long-term relationship is uncertain. But in the meantime Alaska continues to post financial results that are among the best in the US industry, which means that it has a strong foundation from which to defend itself. With Delta’s planned launch of new service from Seattle to Portland and San Diego in Sep-2014 and Jun-2014, respectively, Delta caps off a raft of domestic expansion from Seattle while also building the airport as a key trans-Pacific gateway. Once those new routes launch, Delta will compete with Alaska on six of Alaska’s top 10 domestic routes – Seattle to Anchorage (on a seasonal basis, but with more frequencies planned for 2014), Los Angeles, Las Vegas, Portland, San Francisco and San Diego. Delta will break Alaska’s monopoly status on the service from Seattle to San Diego, and compete with both Alaska and United in the Seattle-Portland market. 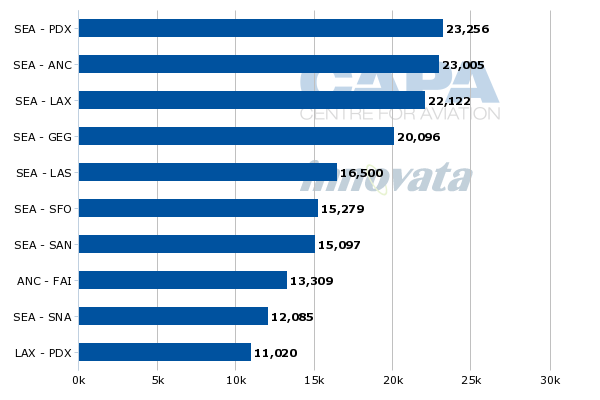 Presently Alaska holds an 89% share of the roughly 13,000 one-way weekly seats on offer (based on current schedules in Innovata for the week of 3-Nov-2013 to 9-Nov-2013), and United accounts for about 10%. During a recent discussion with analysts, Alaska executives not surprisingly fielded numerous questions about Delta’s blatant push into Alaska’s markets. Company CEO Brad Tilden in more than one instance remarked that the carrier “is trying to take the emotion out of this process” to make the best decisions it possibly can. Mr Tilden expressly recognised that there will be instances in future where it is in Alaska’s best interest to work with Delta, noting the US major’s international growth from Seattle. 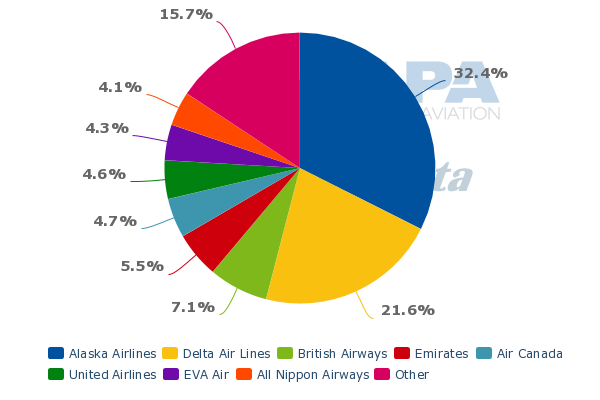 Delta on a seat deployment basis is now the second largest carrier from Seattle into international markets holding a 22% share. Presently, Delta operates international long-haul service from Seattle to Amsterdam, Paris, Beijing, Osaka, Tokyo (Narita and Haneda) and Shanghai. During 2014 the carrier is introducing service to London Heathrow, Seoul and Hong Kong (transitioning service from Detroit). However, Mr Tilden noted that Delta and Alaska would not be codesharing on the new flights Delta is introducing into Alaska’s north-south markets on the US west coast. So it appears Alaska will feed Delta’s international flights from other markets where there is a codeshare in place and compete head-to-head with its partner in other markets. During the discussion Mr Tilden stated that interline revenues represent about 13% of Alaska Air Group’s total revenues, and the relationship with Delta represents about 4% of that amount, either through codesharing, miles redemption or interline agreements. Alaska’s partnership with American represents a little less that the amount generated by Delta. Queried directly about seemingly subsidising a competitor by codesharing on certain flights and why Alaska is not making it more painful for Delta, Mr Tilden explained there are all types of actions Alaska could take, but that it was not in the company’s interest to talk about its strategy during a public discussion with analysts. Amidst all the questions fielded about how Alaska’s relationship with Delta will proceed now that Delta is making an assault on Seattle, Alaska recorded a 3Q2013 profit excluding special items of USD157 million (USD289 million on a GAAP basis). Its top line revenues increased 22% to USD1.6 billion while operating income jumped 75% to USD470 million. Alaska’s return on invested capital for the 12M ending 30-Sep-2013 was 13% compared with 12.7% the year prior. On a unit basis, Alaska Air Group’s yields were essentially flat year-on-year during 3Q2013 as passenger unit revenues decreased 1.2% and unit cost excluding fuel increased 1.4%. The cost creep was driven by increasing salaries and benefits, which on the top line grew 12% year-on-year stemming from a new long-term pilot agreement. For the full year 2013 Alaska expects unit costs excluding fuel to remain flat or rise slightly, and is warning bringing unit costs down in 2014 may prove challenging as its planned capacity growth is just over 5% versus about 7% for 2013. The slowing growth could pressure the carrier’s costs as there will be fewer available seat miles over which to spread its cost. But Alaska also stated its profits during 2014 should be bolstered by an increase in bag fees that took effect in Oct-2013, a modified affinity deal and adding six seats to its Boeing 737-800s and nine to its 737-900s. Alaska estimates those three initiatives should net roughly USD150 million annually. Alaska no doubt faces some challenges heading into 2014 as the attack from Delta continues and its costs are likely to rise in a revenue environment that is still tough to predict. Perhaps it is not the position of choice, but overall the carrier remains optimistic for 2014, likely buoyed by the fact it has little net debt, USD1.4 billion in cash and 46 unencumbered 737s. Those factors do put Alaska on solid footing to defend itself against the competitive threats in Seattle. In the short term the heightened competition with Delta might produce some irrationality in the head-to-head markets that will likely affect Alaska more intensely given its smaller scale. In a rational scenario Delta would only offer enough capacity to sustain feed on its international routes. Without a doubt, the declaration that "alliances are complicated" will be flagrantly obvious in Seattle in 2014. Alaska must surely be plotting a defence with a goal of preserving its dominance in the markets where Delta is creating pressure. Partnerships typically work best where there is a mutuality of interest. Where one partner is substantially larger than the other and interests start to overlap, as is the case here, it is time for the smaller of the duo to exercise its creative potential. Alaska is hardly likely to be able to win against the mighty Delta in open battle - and possibly the answer is in an innovative response that sees two winners and no loser. That outcome is not easy to see; but Alaska is one of the smartest niche players in the aviation world, so we look forward to being surprised.